Update August 13, 2017, at 8:30 am: Critical Missing 16 Year Old Leslie Nayelli Renteria has been located and is safe. The Dallas Police Department is asking for the public’s assistance to locate a critical missing 16-year-old Latin female. Leslie Nayelli Renteria was last seen on August 11, 2017, at about 4:24 pm, in the 2000 block of North Prairie Avenue on foot wearing a grey Nike hoodie with tan leggings. 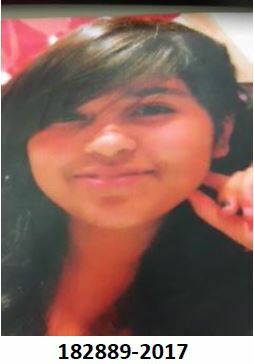 Ms. Renteria is a Latin female 16 years old, 5’00 tall weighing 150lbs, with brown hair and brown eyes. Nayelli Renteria threatned to harm herself. If you see Nayelli Renteria, please contact 9-1-1 or the Dallas Police Department at (214) 671-4268.